18650 flashlights are some of the most reliable flashlights on the market. But, what is the meaning of 18650? 18650 means 18mm diameter and 65mm length of the battery. Just like any other product, If you want to buy 18650 battery flashlight, then you may have confused to see different types of flashlight brands. Not only brand, you may also confused with the AA flashlights and AAA flashlights. For this reason, I have created this best 18650 flashlight review article. Personally, I have used most of these flashlights and you can rely on this review. I know that finding a quality flashlight isn’t easy. If your flashlight battery doesn’t work in an emergency situation, then what is the use of a flashlight? People make mistakes and they purchase wrong flashlight. If you buy a flashlight considering their price, then it may fail to function properly. In order to avoid such mistakes, you have to compare different flashlights and ensure that you get the best and most durable flashlight at a great price. 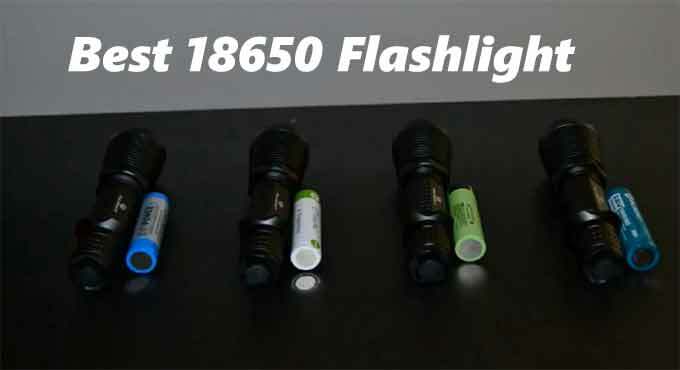 The 18650 flashlights offer users with a number of great features such as a longer run time, greater brightness, are rechargeable, and economical. In addition, a good number of 18650 batteries come protected from things like overcharge and reverse polarity. So, you can rely on the batteries to provide you with several hours of use. 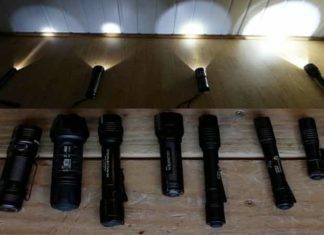 When choosing your flashlight, you should as well consider the brand that you are buying from. In addition, check out customer reviews to know what to expect from the 18650 light that you intend to buy. Looking at just the price or the appearance of the flashlight is not enough. Many times, people have purchased flashlights that have failed to function. Some buy flashlights only for them to be rendered useless after two weeks of use. So, consider to buy from this list for long term use. 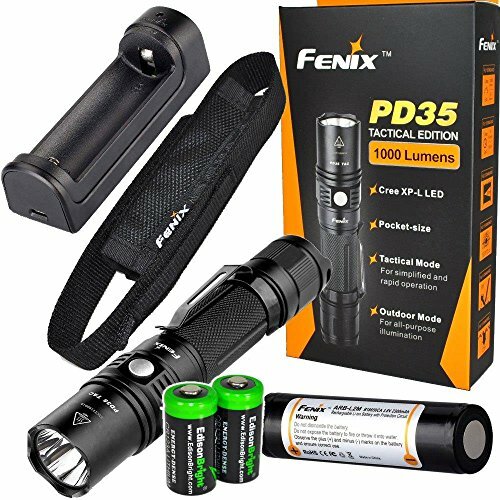 If you are looking for a reliable tactical flashlight for law enforcing, hunting, or hiking activities, the Fenix PD35 is a great fit for you. This is the best 18650 flashlight for tactical use. Made of durable aircraft-grade aluminum, this flashlight has the ability to resist water and impact. The excellent hard-anodized finish prevents it from corroding and scratching. Furthermore, the flashlight uses Cree XP-L (V5) LED that produces 5 light modes and a strobe mode. The light modes include eco, low, mid, high, and turbo modes. It has a long run time of 140 hours and the brightest mode (high mode with 1000 Lumens) reaches up to 200 meters. The flashlight can be powered by one 18650 rechargeable battery or two 3V CR123A lithium batteries. Besides that, it has a stainless steel side switch for easy use and an intelligent memory circuit. The anti-roll body prevents it from rolling when it falls on the ground and the low-voltage feature lets you know when to recharge the batteries. Powered by either two Streamlight 18650 Li-ion rechargeable batteries or 4X CR123A batteries, the Streamlight 88060 is a very bright flashlight. It uses C4 LED technology, which is shock resistant and has a lifespan of 50, 000 hours. The LED emits a maximum of 2, 200 Lumens, which is exceptional for such a compact light. In addition, it provides the user with three light modes and one strobe mode. Operate the flashlight with one hand for momentary-on, variable intensity, or strobe mode. The large head ensures that the user is able to illuminate a large area by pulling it in or out for a spotlight or floodlight, respectively. Also, it has a nice grip that allows the user to easily handle the flashlight in all weather conditions. The light is slightly bigger for an EDC flashlight. So, not good for carrying on a daily basis. The light heats up when used for long. ThruNite is one of the leading flashlight brands on the market. The company always comes up with new and excellent flashlights. The ThruNite TN12 is one of their best selling products and it’s worth every penny. The 1100 Lumen light provides great brightness that can illuminate a person standing 218 meters away. It utilizes the advanced Cree XM-L2 U2 LED, which provides the user with either a cool white or a neutral white beam. It all depends on your preference. 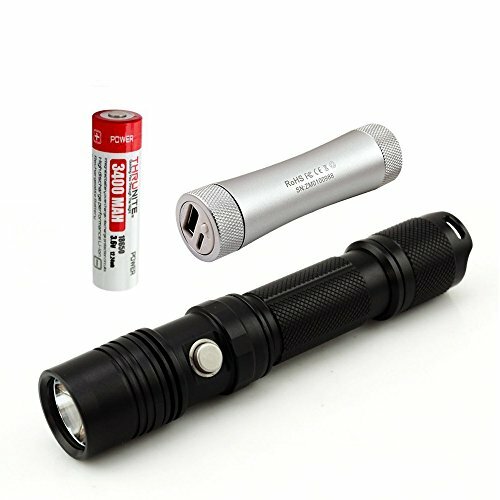 If you are looking for best 18650 flashlight for edc use then buy this. Despite having a wide range of features, the TN12 can be operated easily with one hand. Use the tail switch to turn on the light or the side switch to cycle through Firefly, low, mid, high, or max light modes. Moreover, the flashlight is powered by one 18650 rechargeable battery, which can be recharged at least 500 times. 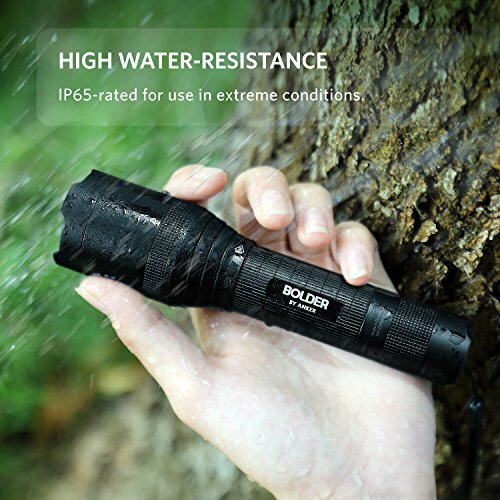 If you intend to use the flashlight in extreme situations, just know that it is rated as IPX8 waterproof and it’s also impact resistant. With its convenient and innovative charging system, the Olight S2R rechargeable flashlight is a wonderful tactical light. It runs on one customized Olight 3200mAh 18650 battery that can be recharged using a USB charger, computer, or power bank. The magnetic tail cap is great for outdoor use and the light has a two-timer. Also, the PMMA TIR lens ensures that the user gets a clear white beam. On a dark night, the Olight S2R light with its CREE XM-L2 LED can produce a maximum of 1020 Lumens, which is just outstanding for its size. If you don’t want to accidentally switch on the light, you can turn on the lock-out mode. Unlike other 18650 lights, this one comes with a low-voltage indicator for warning you when the battery gets low. Other exceptional features include the reverse polarity protection, firm grip, pocket clip, pouch, and flat tail cap. The beam doesn’t cover a long distance as it is supposed to. It is also not variable but just flood light. If you are looking for a 18650 flashlight that you can depend on in all situations, the SureFire P1R peacekeeper will be a good choice. This rechargeable LED flashlight is sturdily built of high-quality aluminum. In addition, it uses an indestructible LED to produce a maximum of 600 Lumens. This means that this flashlight is very bright and covers a great distance. So, you can use it for hunting, hiking, fishing, for emergency services, or for law enforcing. To add on, it has a coated, tempered window for resisting impact and maximizing light output. This is one of the best 18650 flashlight for survival use. 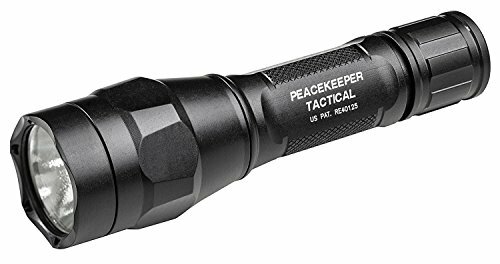 The P1R peacekeeper flashlight is powered by 18650 Li-ion rechargeable batteries. When you run out of power, simply recharge the light using an AC charger, or a DC car charger. It is also easy to use as it has a tail cap switch for momentary-on or constant-on. The hard bezel can be used to break glass or hit an attacker. 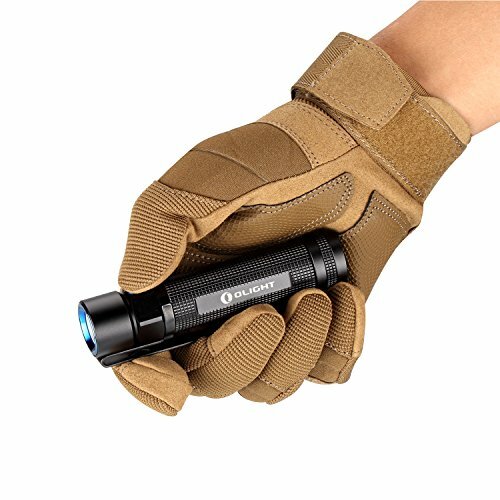 If you are a security personnel or outdoor enthusiast, the Klarus ST15 rechargeable LED light is for you. 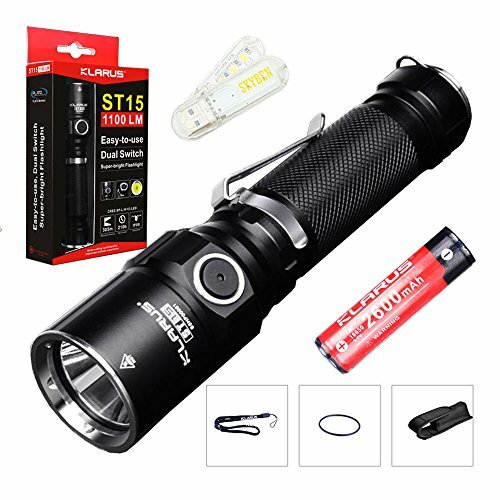 Just like any other Klarus light, the ST15 is sturdily made for tactical and outdoor use. It is made of an aircraft-grade aluminum 6061-T6 body with a hard-anodized finish. The body can resist water and impact. In addition, it has a reflector to provide the user with a smooth but powerful beam. It uses latest CREE XP-L HI V3 LED bulb that emits a maximum of 1100 Lumens. This is great for hunting, mountaineering, hiking, or for any other outdoor activity. Other exceptional features include the 4 lighting modes and 2 flashlight modes. So, you can use it for different purposes. The two-way clip allows you to either insert the flashlight in an up or down position. Insert one 18650 rechargeable battery or two CR123A batteries. When the light is turned on, it remembers the last light mode. PeakPlus is a wonderful flashlight with 5 light modes. It can be zoomed to adjust focus with its greatest throw reaching up to 600 feet. Zoom the light to full brightness, medium brightness, low brightness, strobe brightness, or SOS. It runs on one 18650 rechargeable battery or 3 AAA batteries. 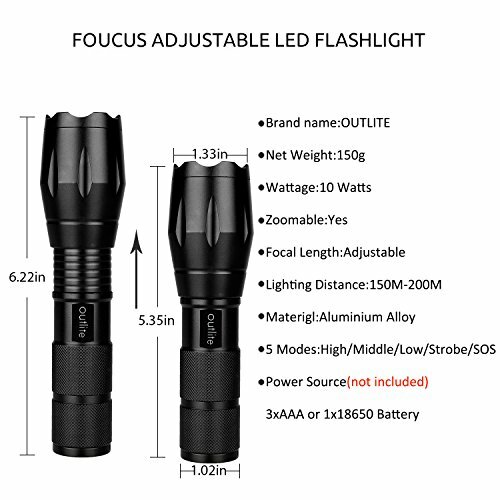 The flashlight is also water resistant and shockproof; thus making it ideal for tactical situations, camping, hunting, outdoor, military, fishing, or for general use. It is one of the cheapest, but best 18650 flashlight. 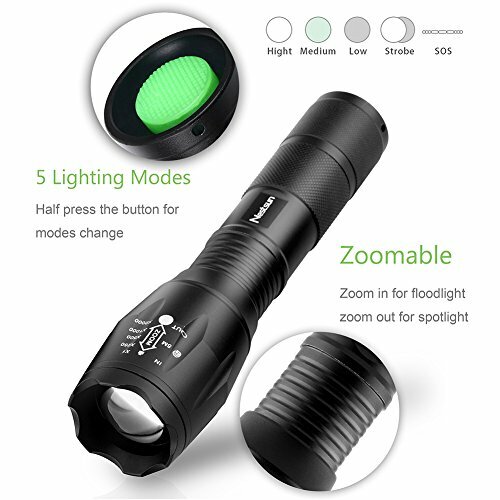 Using this flashlight is a joy as it comes with a wide range of accessories such as case, 1X 18650 rechargeable battery, AA battery holder, lithium ion charger, and a user manual. At such a great price, you will be able to get a quality light that brightens your path, camp or even a dark alley. The beautiful and sturdily made Anker tactical LED flashlight is a quality 18650 light for versatile use. It uses CREE LED which produces a maximum of 900 Lumens and offers the user with 5 light modes. The light modes are low, medium, high, strobe, and SOS modes. The flashlight is made in a unique way so that it can perfectly fit in your pocket. Additionally, it has an anti-slip finish that allows the user to hold the light tightly even when in tensed situations. The flashlight runs on one 18650 3350mAh battery that can be recharged using the micro-USB cable included in the purchase bundle. Other excellent features are IP65 waterproof rating, maximum beam distance of 200 meters, a runtime of 6 hours, zoomable light, and a shock-resistant body. 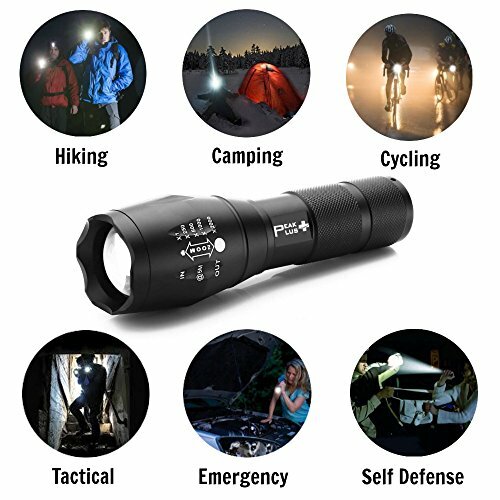 With such outstanding features, this is a great flashlight for hunting, dog walking, hiking, and for law enforcing. On top of that, the manufacturer offers the user with an 18-month warranty. For those who don’t have much to spend, but still want a quality and bright flashlight, the Outlite A100 LED flashlight is a great option. The flashlight uses LED technology with a lifespan of 100, 000 hours. When the head is adjusted to spotlight, the beam covers up to 600ft, which is just amazing for outdoor use. Powered by on 18650 lithium-ion battery, this flashlight will offer you 5 light modes to select from. These are the low, mid, high, strobe, and SOS modes. Strobe mode can be utilized to disorient an assailant, while the SOS mode can be used when you are in danger or lost. Outlite A100 is the best 18650 flashlight for the money. This durable flashlight is made of high-quality 6061T aluminum alloy and it is waterproof. As a result, you can use it in rainfall. Alternately, you can power on this flashlight using 3X AAA batteries. Since it’s a durable light, you can use it for outdoor or general activities. The Urpower is another outstanding 18650 rechargeable flashlight. It might be the cheapest flashlight on this list but it still performs well. Similar to most of the best 18650 flashlights, this LED light can be zoomed in or out for a spot or flood beam. In addition, it has 5 light modes, which make it be versatile. When you run out of power, easily charge the flashlight using its charger which is protected with the overcharge feature. Also, it has the reverse polarity and short circuit protection feature. What makes this light to be unique is its exceptional brightness that can brighten a very dark area and cover up to 1150 ft. Use it outdoors without the fear of rainfall or dropping, as it is both water and impact resistant. Also, the aluminum construction will give you years of use. With a runtime of 5 hours, this is a great light for walking the dog, hunting, or even fishing. It has a short run time which may not be ideal for most outdoor and tactical activities. What is a 18650 flashlight? 18650 is a battery and if you use that in your flashlight, then it will be called as 18650 flashlights. What does mean of 18650? 18650 means the size of the battery and it’s 18mm by 65mm. What type of chemistry is used in 18650 batteries? What is the Voltage of 18650 batteries? The 18650 battery is usually rated at 3.6volts or 3.7volts. A flashlight is a great survival tool that every person ought to have. It doesn’t matter if it’s walking your dog in the evening, camping, hiking, reading in the dark, fishing, emergency response, law enforcement, or any other outdoor activity, a flashlight will still make the difference. The best 18650 flashlight will give you more flexibility than any other flashlights. The 18650 batteries have proven time and time and they can be relied on due to their longer runtime and rechargeable nature. So, you don’t need to buy batteries more often as they can be recharged several times. Hope you have found a flashlight from our list that you think will help you out in your endeavors? Question: My flashlight is flickering, what should I do? Answer: There are various reasons that may cause your flashlight to flicker. The first and most common cause is a dead battery. If the battery is dead, replace it. Another cause is dirt on the screw threads or other contacts. Rectify this by cleaning the contact points using a cotton ball dipped in alcohol. Question: How do I change the batteries in my flashlight? Answer: Changing the batteries in your best 18650 flashlight shouldn’t be a problem at all. Just remove the cap, which is usually located at the tail end of the flashlight by twisting it counter-clockwise. Get rid of dead batteries and put new ones with the negative of the flat side of the battery facing the spring in the flashlight. In case your flashlight utilizes a battery cartridge, place it with the arrow pointing towards the flashlight. Question: Is there any difference between waterproof and water-resistant? Answer: Yes, there is. If your flashlight is rated to be waterproof, this means that it can be submerged in water and still function very well. But if it is said to be weather-resistant or water-resistant, this means that it can resist water but when submerged in water, it may fail to work. Always check the flashlight rating before submerging it in water. Still, have a question after reading this best 18650 flashlight? comment below. Will the flashlight be damaged if an 18650 5000mAh is used instead of an 18650 4000mAh? It will not damage 18650 flashlights. But, 5000mAh battery has more capacity, more storage. That means, it will last a bit longer than 4000mAh.